First, there’s actually getting hired. Interviews at top tech companies are infamously difficult. Luckily for you, the Paysa team has you covered here on the blog. Check out these guides for succeeding in interviews at some of the big players like Airbnb, Google, Apple, and Dropbox. Second, there’s evaluating job offers. Whether you’re straight out of college or a seasoned veteran of the industry looking for something new, it’s tough to know what separates good from great when it comes to offers for tech jobs. Which is why today’s blog post walks you through an extensive, no-BS guide to comparing tech job offers. You’ll learn exactly what to consider when evaluating your offer and how Paysa can help you make the right decision for your career. But First, Let’s Look at the Different Components of a Job Offer. You might think about a job offer as just the salary you’ll receive for a new position. The truth is, there’s a lot more to it than that. Before diving into how to evaluate a job offer, let’s summarize exactly what you’ll be evaluating. Job title and description. Might seem a bit obvious, but you want to make sure the job you’re being offered is the one you actually interviewed for. Though the nuances in responsibility may be small for a “senior project manager” and a “senior technical project manager,” make sure you’re clear on the job being offered to you. That includes the title, responsibilities, and career path. Salary and stock (or equity). Of course, the financial component is critically important. But salary only makes up one piece of the compensation package. You’ll want to look at base salary, bonus and/or commission structure, stock or equity plans, and if you’re talented enough, your sign-on bonus, to get a full picture of what’s being offered. Benefits and perks. Benefits and perks act almost as another form of compensation. If there are free breakfasts and lunches every day, that’s money you’ll be saving at the grocery store or going out for meals. Tech companies shell out some amazing perks in an attempt to retain top talent, so make sure you’re fully accounting for these when considering the offer. These three areas make up the major components of a job offer. Now let’s explore exactly how you can use these three areas to compare tech job offers. Companies are finding new, creative ways to title their tech jobs in an attempt to make them more attractive to top talent. Who will this position report to? Any changes to the role or responsibilities since I started the application process? What’s the title for the position directly above this one? What’s the title for the position directly below this one? Those last two questions should give you a great idea of where you rank within your new company and whether the title you’re being offered actually aligns with your skills and experience. Visit Paysa.com and Enter the Title and Company into the “Salary” search. Check out the “Skills” section of the page to see how your skills match. Are you overqualified? Underqualified? A perfect fit? Repeat the same for the job titles above and below yours. Is there a noticeable difference in responsibility? 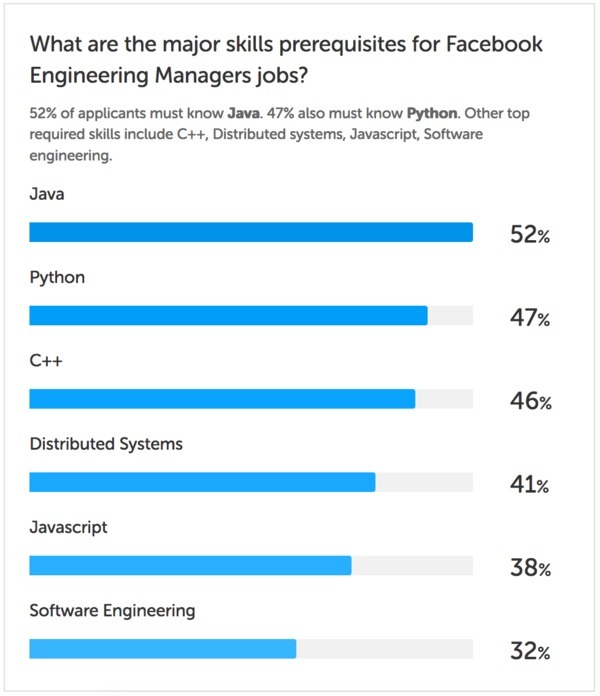 Average skills for an engineering manager at Facebook, per Paysa data. You want to make sure the job is aligned to your career goals as well as your current skills and experience. Taking a more junior role – even to get your foot in the door at a bigger company – can leave you feeling bored and unsatisfied. While taking a position you’re under-qualified to do has it’s own dire consequences, of course. There’s no doubt that for many people, the difference between accepting and declining an offer hinges on the compensation. And to reiterate – that’s okay. After all, more often than not, people are working to get paid so they can afford to enjoy life outside of work. You need a decent salary to make that happen. Comparative salaries. Unless you’re a veteran of the tech industry, it’s tough to know whether the offer you receive is competitive in relation to other top companies. That’s where Paysa can help. 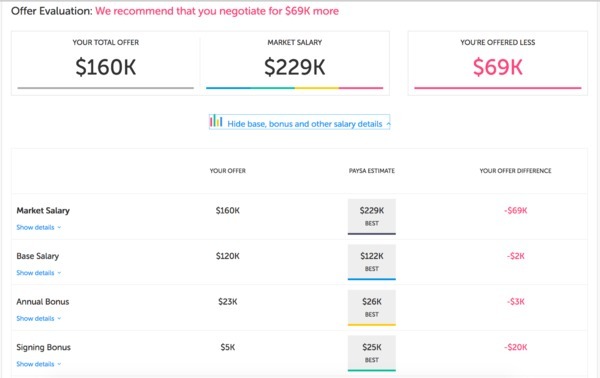 Not only can you search the salary range for the exact job at the company where you received an offer, but with Paysa’s “Offers” tool, you can figure out whether you’re earning what you should based on your skills and experience. Paysa Offers preview for a software engineer at Google. Location. You may find that the same job at the same company earns different salaries based on where the position is located. That’s because the cost of living in San Francisco versus Omaha differs dramatically, therefore companies adjust their compensation plans proportionately. Luckily, Paysa provides cost of living data in most cities and towns in the US so you can see how far your potential new compensation plan will take you in your city. Average cost of living in Boston, MA, per Paysa data. How do I earn my bonus/commission? Is there a cap on my earning potential? What percentage of the team earned their expected target compensation last year? If you’re receiving stocks: How many shares will I be granted? How do you determine the exercise price? What does the vesting period look like? If you’re receiving equity: Who else has received shares? What happens to my equity of the company is acquired or goes belly up? Compensation can make or break a job offer, which is why it’s important you’re thorough in evaluating an incoming offer and not quick to react to a base salary alone. One of the many reasons people flock toward careers in tech centers around the often unbelievable benefits and perks offered by some of the top tech companies. Together, the two often add up to a significant form of second income based on cost savings. Let’s talk first about how to review your benefits offering before diving into the perks piece separately. For the sake of this article, let’s focus on medical benefits (i.e. health insurance, vision, dental, etc.). There are a few key areas to pay attention to when reviewing your benefits package. Cost. Many of the big tech companies absorb the entire cost of your health coverage, but that may not be as feasible for smaller startups. Either way, you need to know what – of anything – you’re being charged on a monthly basis for your coverage, whether that charge comes pre-tax, and if you’re able to pick-and-choose your coverage. Who is covered. If you have a family, it may be important to ensure their coverage as well under your plan. Is your family eligible for the same level of coverage? If so, is there a cost associated? When coverage begins. When starting a new position, health benefits may not kick-in right away (depending on the company). Make sure you know exactly when coverage begins so you and your family can plan accordingly. Perks include everything from a company’s time-off policy to the food they serve in the cafeteria. Evaluating a company’s perks should be like shopping for a new car in a lot of ways: think about what you need based on your lifestyle and find the perfect match from there. Are you a family man? Maybe you need the “minivan” of perks packages, like a looser work-from-home policy and reimbursement for day care. Or are you the work hard/play hard type? In which case, the “sports car” – built for performance with gym memberships and healthy eating options – might be the better plan. Either way, be realistic about the perks and the value they’ll actually add to your life. Free, on-site dry cleaning might sound cool and luxurious, but if you’re a t-shirt and jeans kind of gal, how often are you really going to take advantage of that? There you have it! This guide should get you started on asking the right questions to really ensure the offer you receive is the offer you deserve. But you’re going to need Paysa’s help along the way to really make sure you’re landing the job of your dreams. Use Paysa to evaluate your offer, compare salaries, and figure out the cost of living in the market where your new job is based. And if you’re just starting the job search, Paysa can help there as well. Visit Paysa.com today to get started.